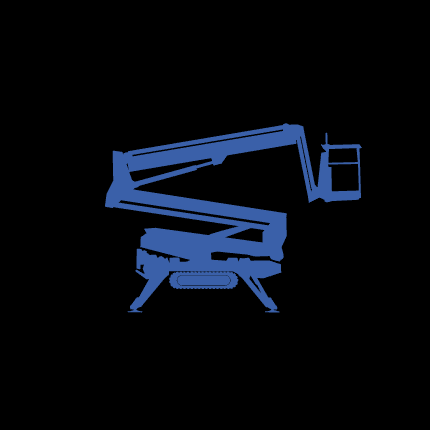 SPJ315 is a tracked aerial platform able of a maximum working height of 15 m and a maximum working outreach of 7 m. The Safe Working Load is 225 kg (2 operators + tools) without restrictions throughout the working area, resulting in high performance if compared with the reduced overall dimensions, only 78 cm width during translation (with basket removed). This tracked aerial platform is equipped with a standard wired remote control for translation and stabilization which ensures maximum safety for the operator (optionally SPJ315 can be equipped with wireless remote control); the standard engine is a 13 hp gasoline Honda, optionally a diesel Lombardini engine can be mounted . The 350° rotation of the aerial part, together with the vertical rotation of the hydraulic jib, from 90° to +35°, increase the overall working area. SPJ315 can be equipped with extendable tracks and 230 V electric motor, which are essential for operations in confined spaces such as industrial buildings or churches.